Transaero Airlines has announced the usage of its on-board internet and mobile communications system. Called Transaero Connect, the system enables passengers to access the internet during flights as well as make calls and send texts from their personal mobile phones. In the first six months of 2014, passengers sent more than 1.5 million SMS text messages and made more than 24,500 calls. During the same period, the Wi-Fi connection traffic totalled 1,900 Gb across the Transaero fleet which have satellite equipment installed. Transaero has been offering access to high speed broadband internet since August 2012 and was the first Russian airline to do so. The service is available on board 31 aircraft in its fleet, including nine Boeing 747-400s, five Boeing 777-300s, eleven Boeing 737-800s and four Boeing 737-700 aircraft, which are operated both on domestic and international routes. Internet access is also available on board two Boeing 737 Classic (Imperial and Business jets) that serve corporate charter flights. The highest demand among passengers for mobile communication services was recorded on the Boeing 777-300 and Boeing 747-400 aircraft. Transaero’s aircraft are equipped with the most advanced high-speed inflight internet access system currently available via Ku-Band, which is based on satellite technologies and provided by Panasonic Avionics’ Global Communication Suite (on Boeing 747 and Boeing 777 long-haul aircraft) and Row44 (on Boeing 737-700/800) systems. Ku-band technology allows passengers to gain internet access, check e-mails and use social media. The Ku-band system uses an 11.7-14.5 GHz frequency spectrum and enables data transmission with speed from 5 Мb/s. 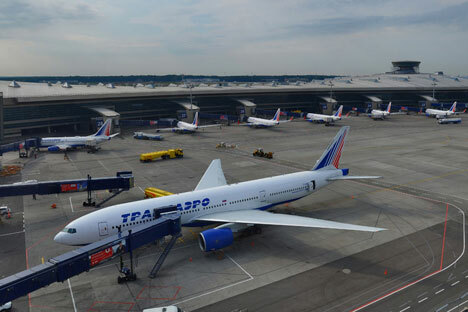 The Transaero Connect service is the most affordable available in the Russian market. Connections to high-speed internet on long-haul flights cost 800 rubles ($21.7) for the duration of the flight, or 400 rubles ($10.8) per hour. Passengers on medium-haul flights, on a Boeing 737NG, pay 600 rubles ($16.2) for internet connection throughout the flight or 300 rubles per hour ($8.1). Transaero offers special scratch cards providing for free access to internet to its premium passengers of Imperial and Business classes flying on board Boeing 777-300 and Boeing 747-400 aircraft with Wi-Fi access.